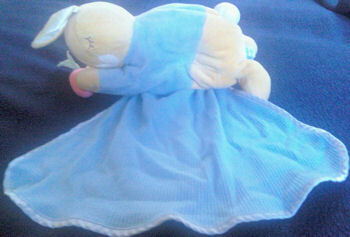 I’m trying to find an Eden plush Peter Rabbit baby toy that my 9 year old daughter received when she was born. It has ears that crinkle when you touch them, and it has a small blue security blanket that is stuffed inside it’s stomach. It’s very soft and cuddly. It is about 8 inches long. The rabbit is light brown. It’s all plush, the jacket is blue and the security blanket has satin edging. My daughter loves this toy, and I would like to give one to my husband’s niece, who is expecting her first child. I’m not sure if they still make it. I haven’t had much luck searching on-line. Thanks for the lead! We didn't realize how hard it was to find one! !